Whether it was a bad night and you were pulled over for drinking and driving or you were simply in the wrong place at the wrong time, finding yourself behind bars is an unpleasant scenario at best. Here at Affordable Bail Bonding, we know how difficult it can be when you are taken to jail and you need to return to your normal life. That is why we are a trusted Chatham bail bondsman, serving communities across Pittsylvania County. If you have been arrested in Chatham or in the nearby area, make sure you keep the following tips in mind. During an arrest, it is easy to feel your temper flare or for panic to set in. However, the more agitated and upset you become, the more trouble you can land yourself in. Fight the urge to yell at the cops and keep your language respectful. It might not be a fair situation and you might be in the right, but you will only make things more complicated if you begin to act erratically. Keep your answers simple, to the point, and cooperate with the police. Never threaten an officer or try to escape arrest. Once you are being placed under arrest, try to gather as much information as you can. Where are you being taken? What are you being arrested for? Remember, don’t become agitated as you ask questions, but do your best to figure out what situation you are in so you can make the best choices accordingly. Once you have been arrested, if a judge sets a bail amount for you, there is a chance for you to get out of jail. In order for that to occur, you need to post bail. When the bail amount is too much for you to afford, this can quickly seem like an impossibility. That is where our bail bondsmen come into play. 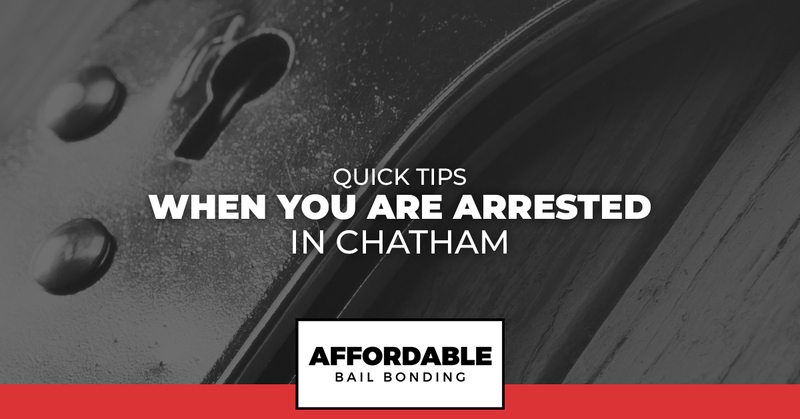 You simply give a Chatham bail bondsman a call, pay a percentage of the bail amount, and we post bail on your behalf. It is that simple. You can ask a loved one to contact a bail bondsman or you can do it yourself. The sooner you contact a bail agent, the faster you can get out of jail. Once you are out of jail, find yourself an attorney to take on your case. Having a lawyer on your side will go a long way in building a proper defense. Lastly, make sure that as you await your trial, you keep your life in order. Follow the law. Obey any probation requirements and take the advice of your attorney. Be sure that you keep track of your court date and show up for trial. If you have been arrested in Chatham and need bail, contact our team right away. We work around the clock and will assist you in finding an affordable bail bond solution.